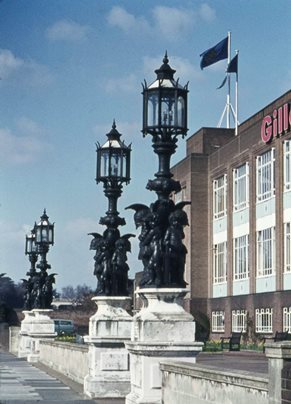 Peter Young took these photos of the Gillette factory on the 3rd July 1973 and 3rd March 1974. The first shows the Deco factory frontage in the spring of '74. This was one of the later additions to the Great West Road, lying at the western end of the 'Golden Mile': the Ordnance Survey map published in 1936 shows a field of nearly 11 acres at the junction of Syon Lane and the GWR; this junction was later to take its name, Gillette Corner, from the factory. Google StreetView from June 2016 shows few changes to the building, the main difference being the loss of the red Gillette signage; and, of course, the roads look very busy today. Wikipedia notes the building was designed in 1936/7 and adds 'no commercial buildings could be built further west along the Great West Road after Syon Lane (Gillette Corner) as the land was owned by the Church Commissioners. 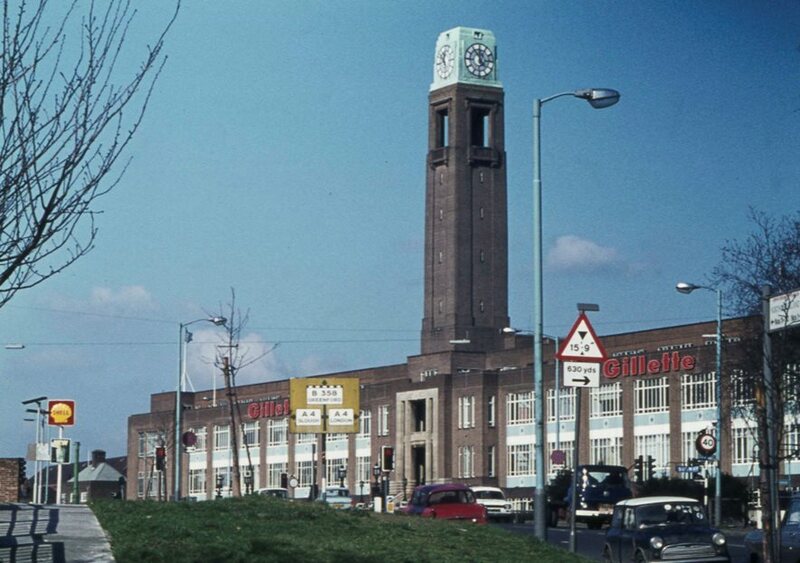 Syon Lane railway station was built especially for the workers at these various factories'. Mayor of London, Sir George Broadbridge. blades per day and 25,000 razors. Reporting the same event, the Gloucestershire Echo set a jauntier tone and included this gnomic quote from the Mayor of London 'War may rage and kingdoms may rise and fall and years may pass and things may change, but every morning before breakfast, all over the world, man must scrape his chin, never knowing the satisfaction of feeling that a good job has reached finality' and noted that the area shaved each day in the British Isles amounted to about 125 acres and comprised around 50,000 miles of growth. In 1941 the company placed adverts for scrap brass (such as old safety razor frames) in various local newspapers. 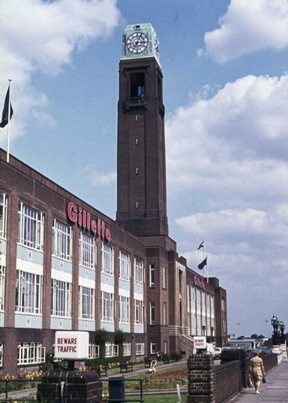 The scrap was melted down and Gillette sent any proceeds to the Royal Air Force Benevolent Fund. 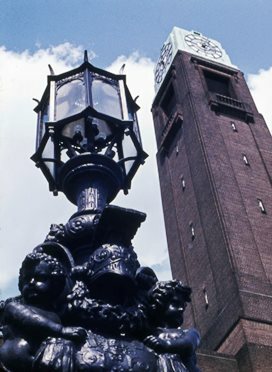 The first photo below gives another view of the frontage, summer 1973; the second shows the ornate octagonal iron lamps supported by cherubs set against the landmark clocktower; apparently the lamps are Victorian streetlamps, originally gas but converted to electricity; and the final shows another view of the frontage and lamps from spring '74.